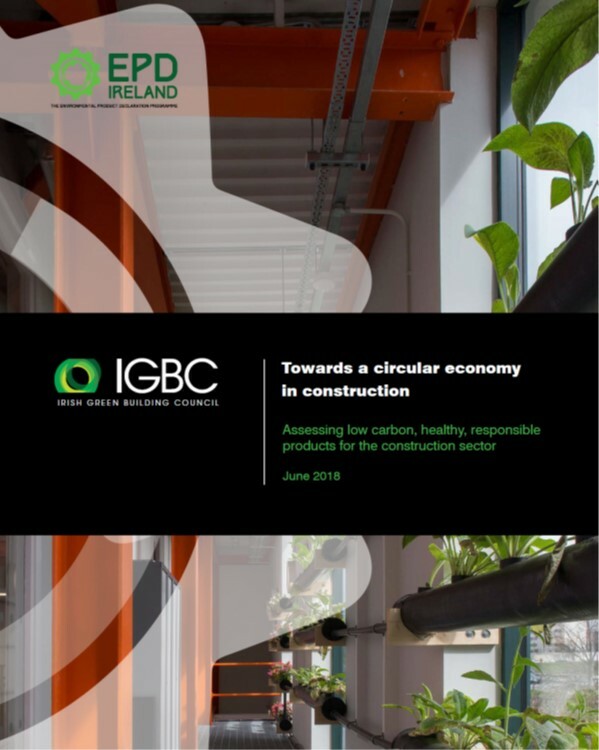 Key publications and resources from Irish Green Building Council and others for the Green building sector. 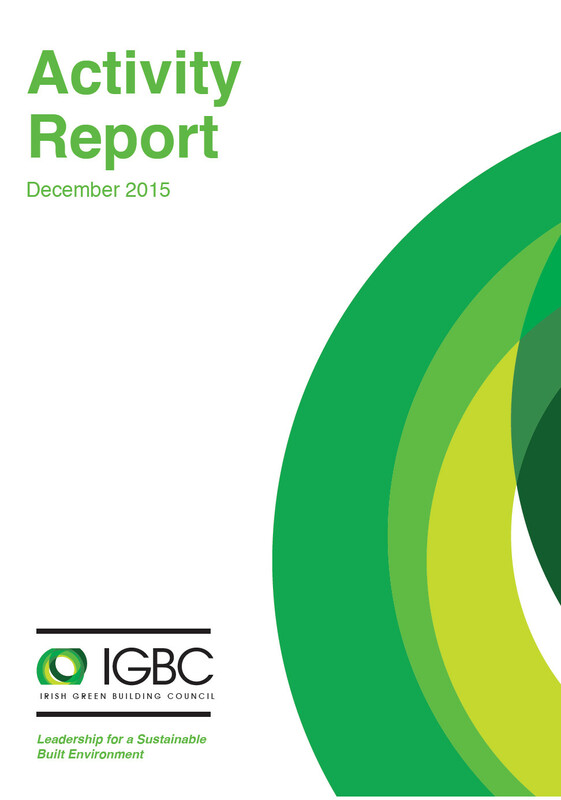 Some are members only content and require membership of IGBC to view. 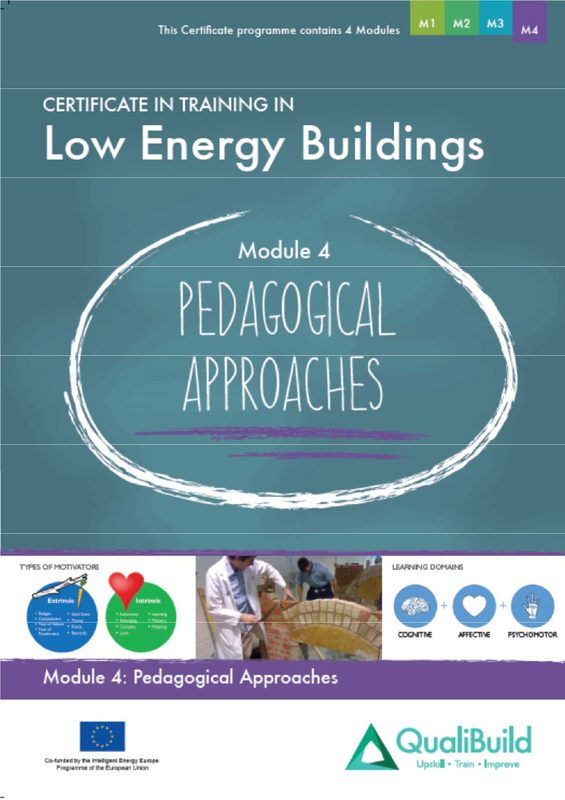 If you are a member login now to view all resources. 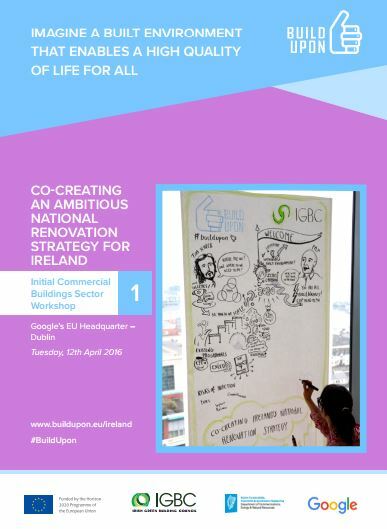 IGBC kicked off its strategy development with a workshop organised on 12th March with its members and key stakeholders and supported by the EPA. A copy of the workshop report is available here. 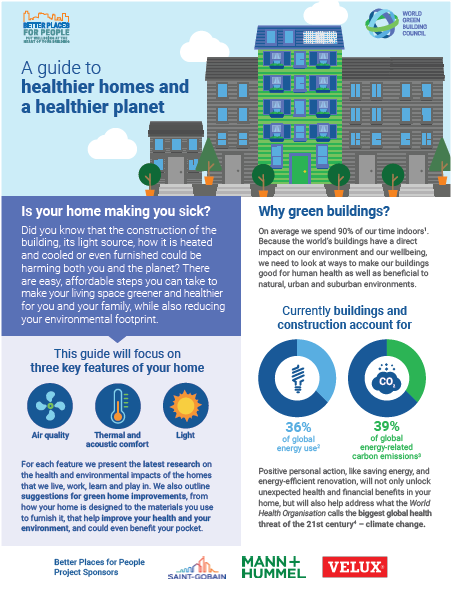 World Green Building Council's Guide to healthier homes and a healthier planet. 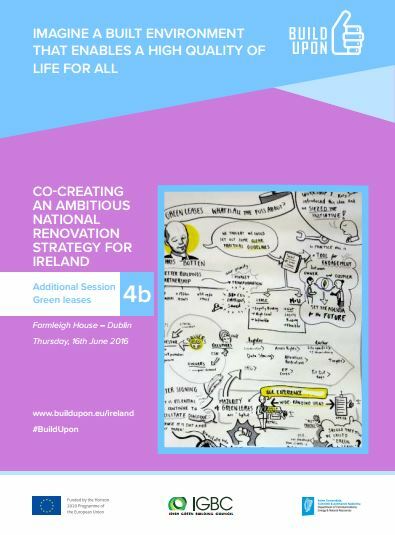 Session 4- Meeting the Renewables Energy Ratio (RER) - Follow this link to view Presenter: Edith Blennerhassett, Arup and Luis Gay-Tarazona Arup How can we meet the requirements of the Renewable Energy Ratio (RER) for non-residential projects? 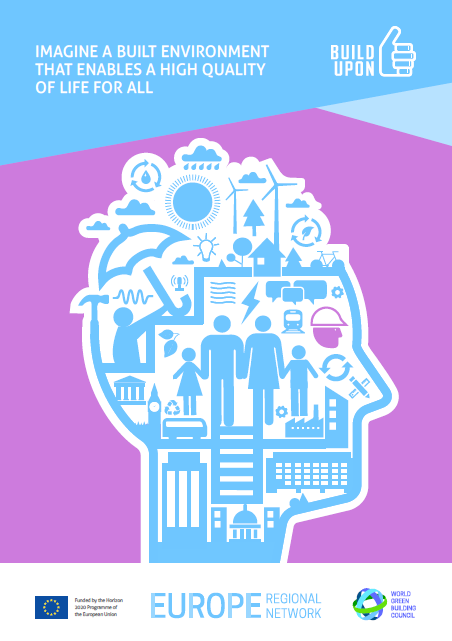 What are the different options to suit different circumstances and locations? 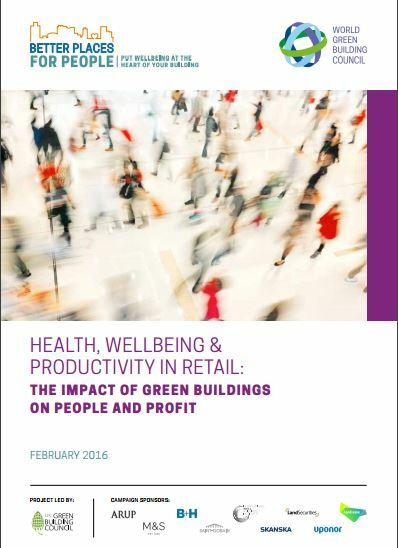 The World Green Building Trends SmartMarket Report can be downloaded here. 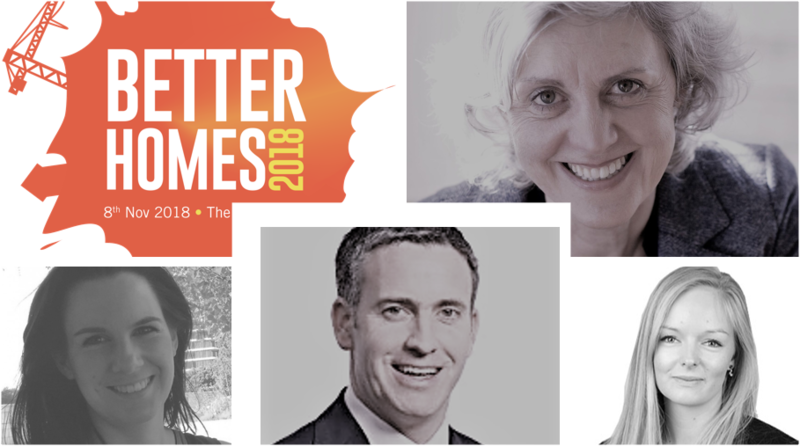 BETTER HOMES 2018 presentations can be downloaded here. 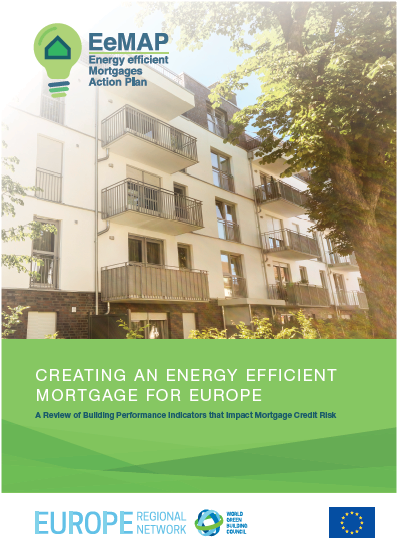 New Report Sets Out How Mortgage Lenders Can Protect Borrowers from the Financial Risks of Climate Change. 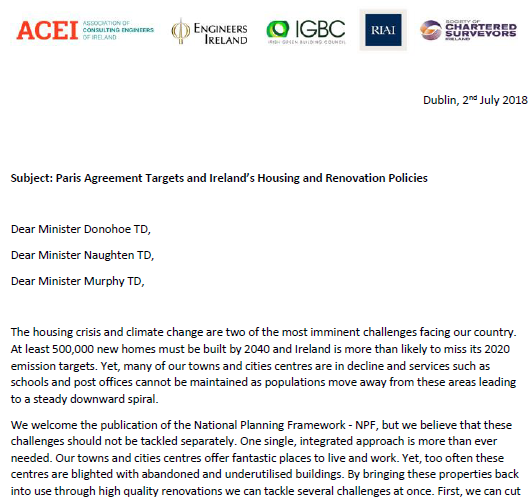 Joint letter signed by Association of Consulting Engineers of Ireland, Engineers Ireland, Irish Green Building Council, Royal Institute of the Architects of Ireland and Society of Chartered Surveyors Ireland to Ministers Donohoe, Naughten and Murphy calling for a more Holistic Approach to Energy Renovation. 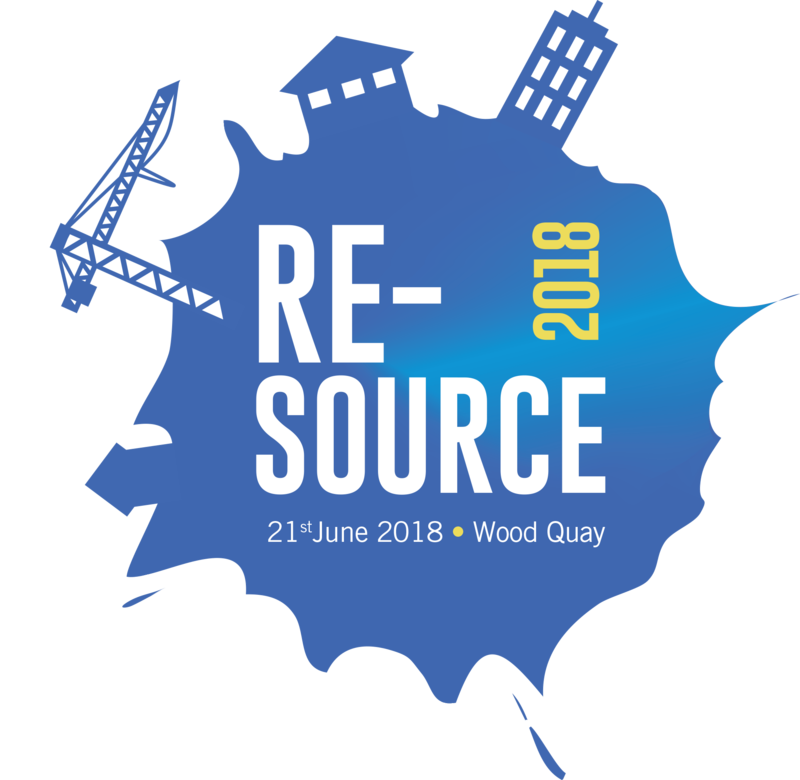 Presentations delivered at the Re-Source 2018 conference. 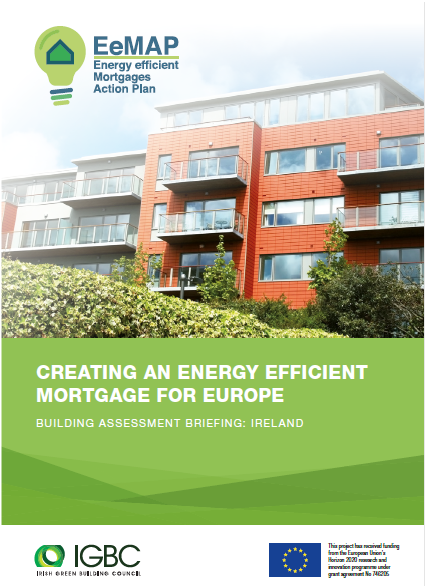 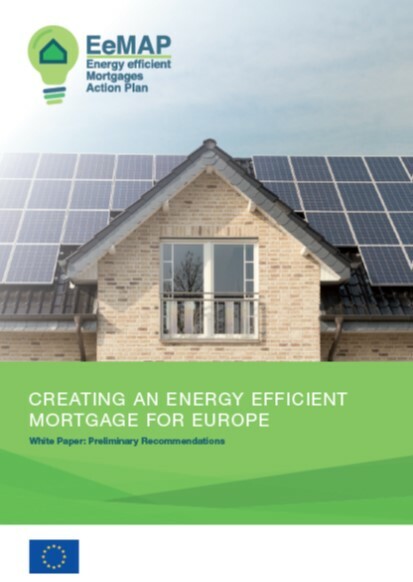 A summary of the Irish Workshop to provide feedback on the Energy Efficient Mortgages draft proposals. 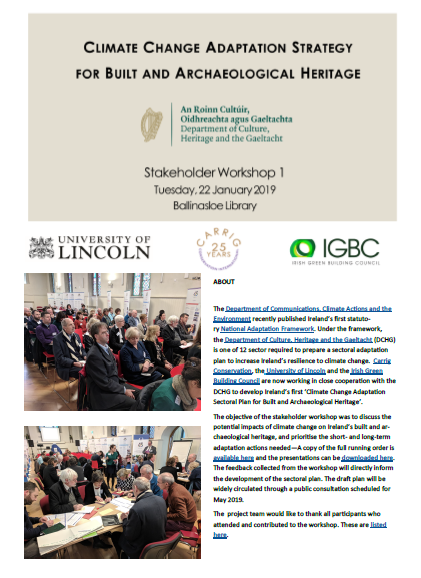 A short summary of the last workshop organised as part of the “Environmental Certification for Construction Professionals” project. 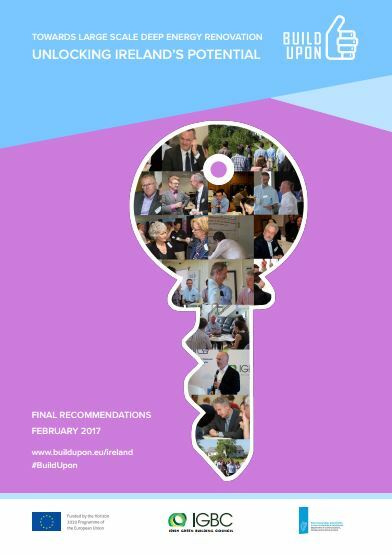 The report can be downloaded here. 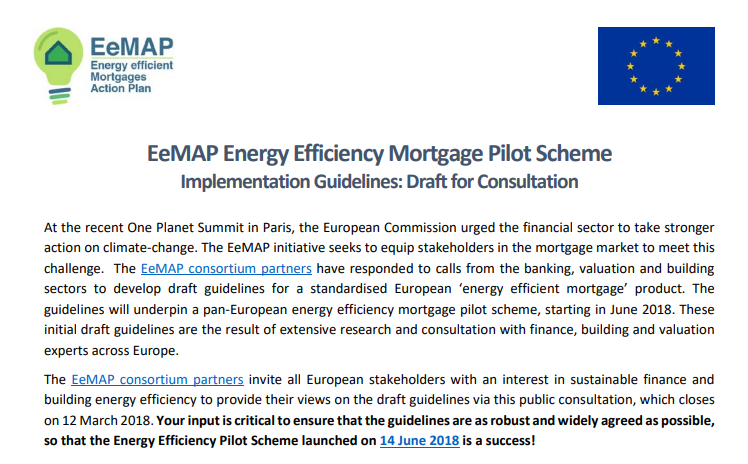 Further information on this project is available here. 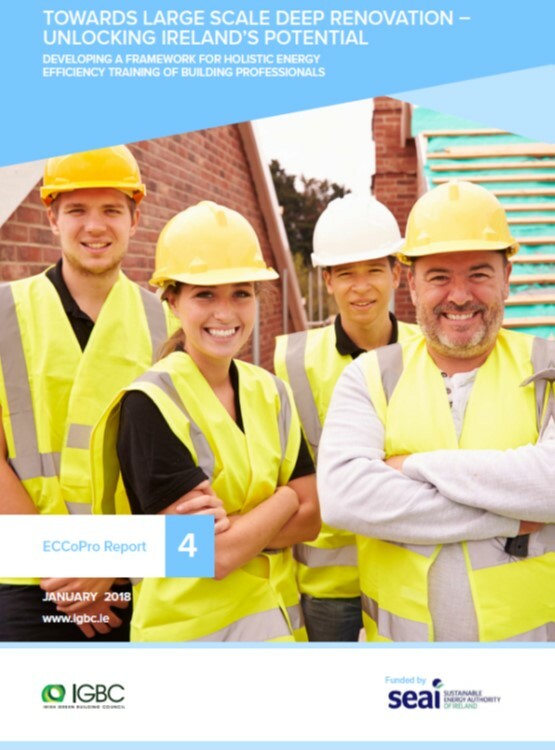 A short summary of the third workshop organised as part of the “Environmental Certification for Construction Professionals” project. 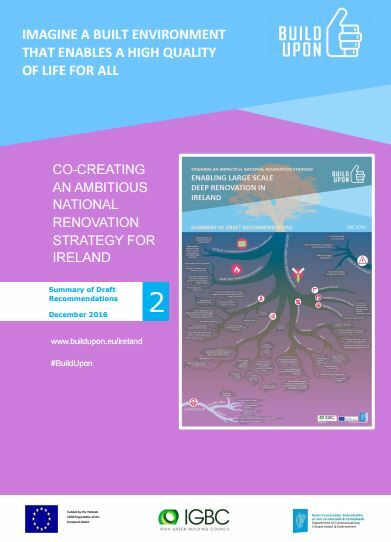 The report can be downloaded here. 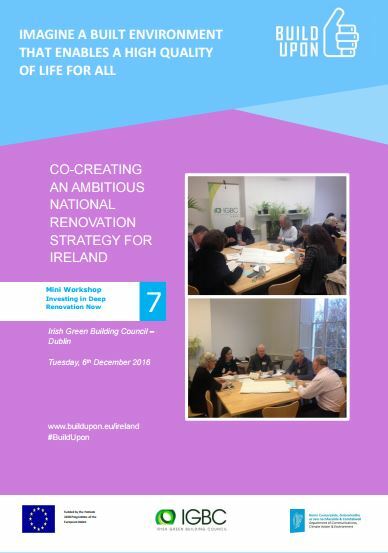 Further information on this project is available here. 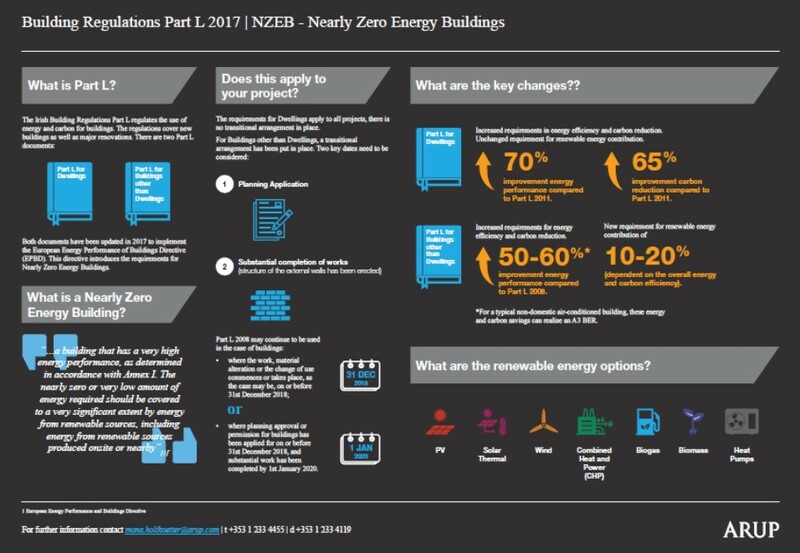 ARUP's infographic on Building Regulation Part L 2017 - NZEB. 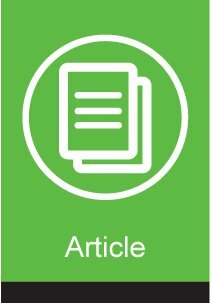 Please click here to access a the document. 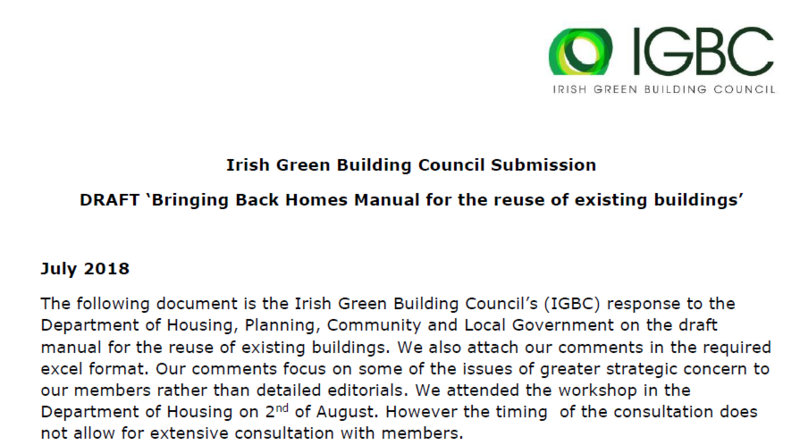 Initial set of recommendations produced as part of the Environmental Certification for Building Professionals project. 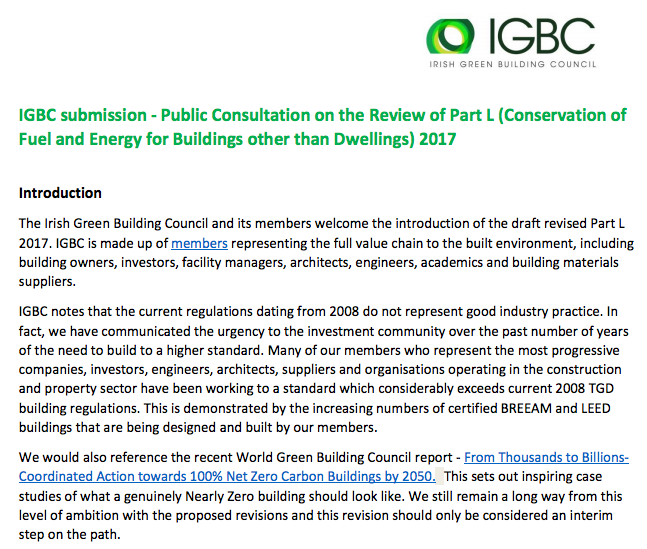 Interested parties are invited to send any feedback they may have on this document to Marion@igbc.ie by Tuesday 20th February 2018. 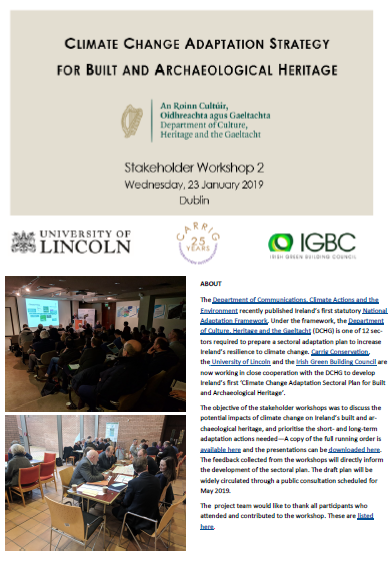 A short summary of the second workshop organised as part of the “Environmental Certification for Construction Professionals” project. 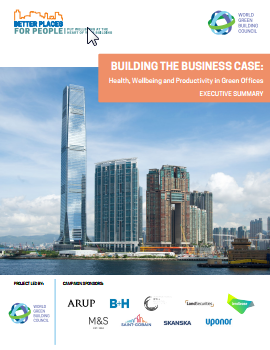 The report can be downloaded here. 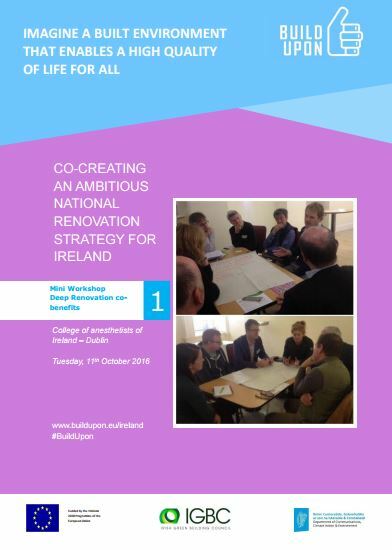 Further information on this project is available here. 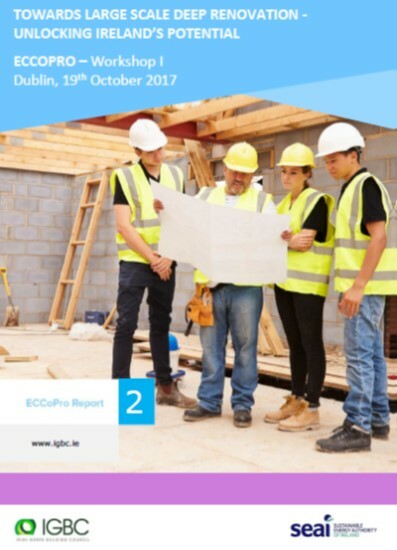 A short summary of the first workshop organised as part of the "Environmental Certification for Construction Professionals" project. 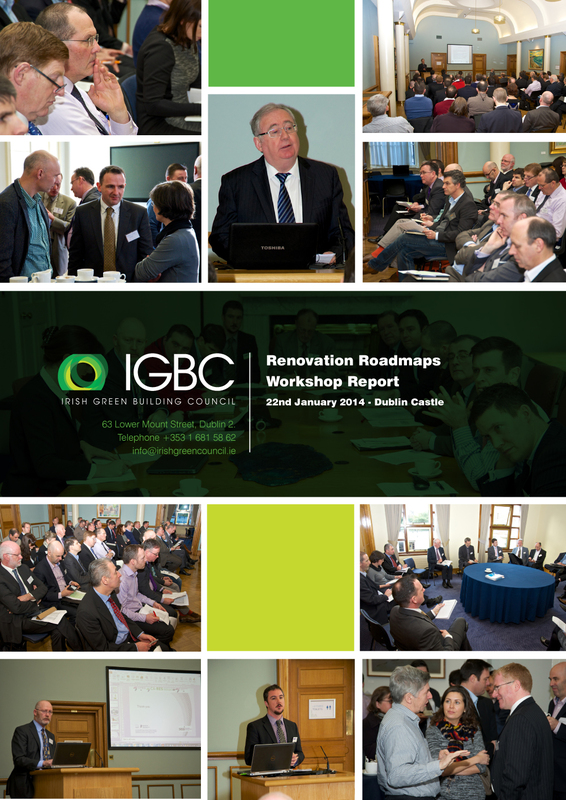 This document presents a list of recommendations flowing from four workshops on large scale deep renovation organised by the IGBC, in conjunction with the Department of Communications, Climate Action & Environment in April – June 2016. 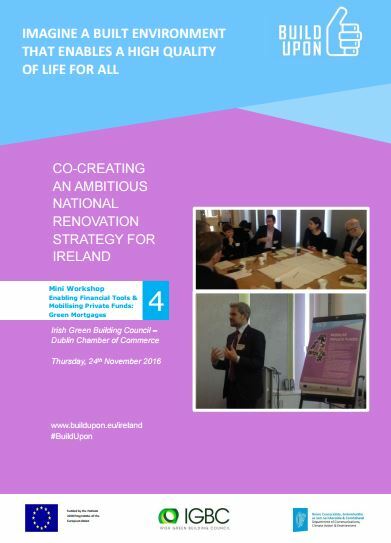 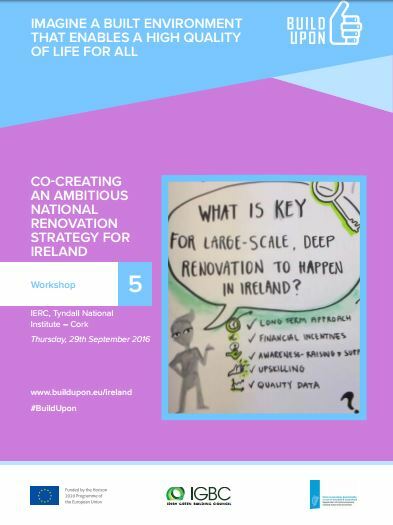 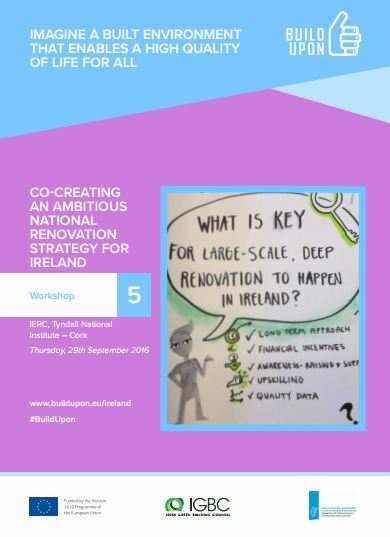 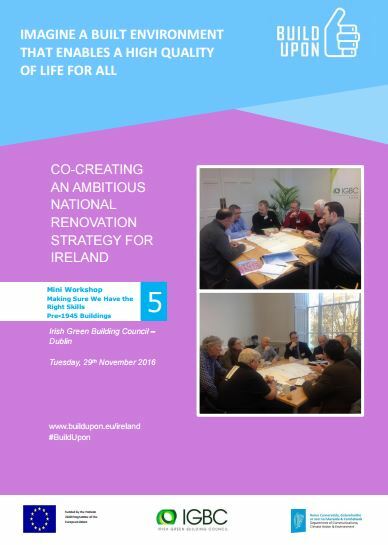 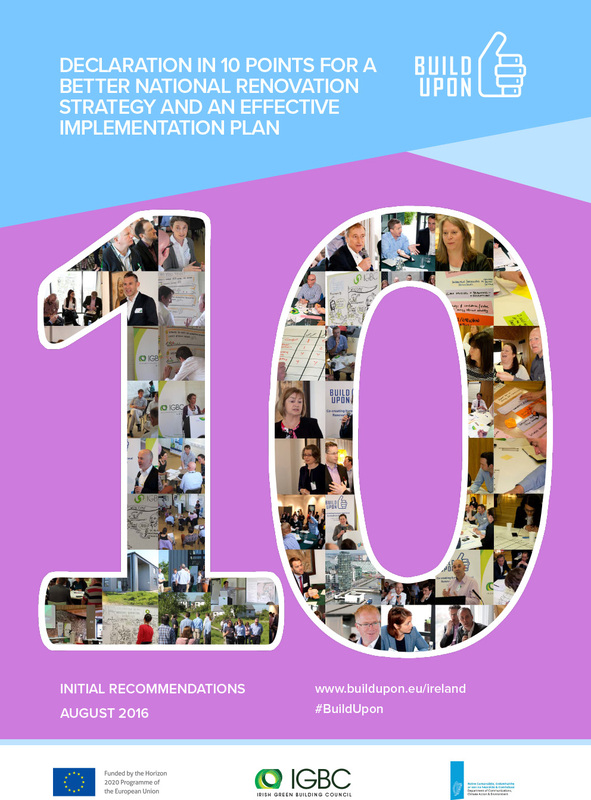 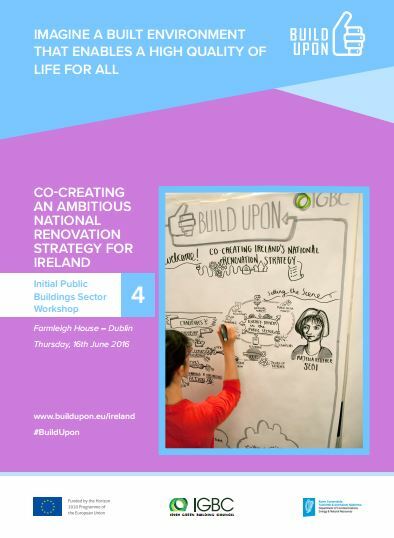 A copy of the workshop reports can be downloaded at www.buildupon.eu/ireland. 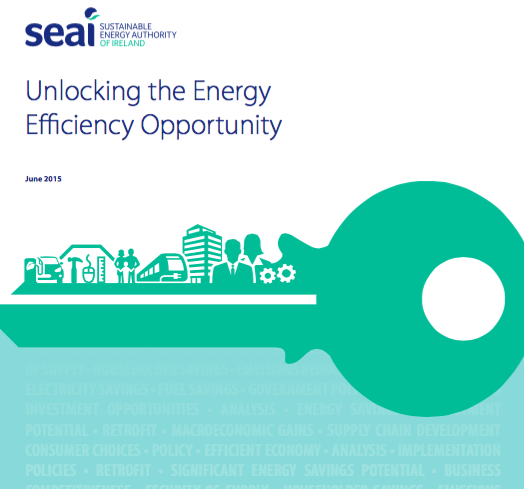 Analysis of the potential for energy efficiency improvements across all major energy consuming sectors in Ireland to 2020. 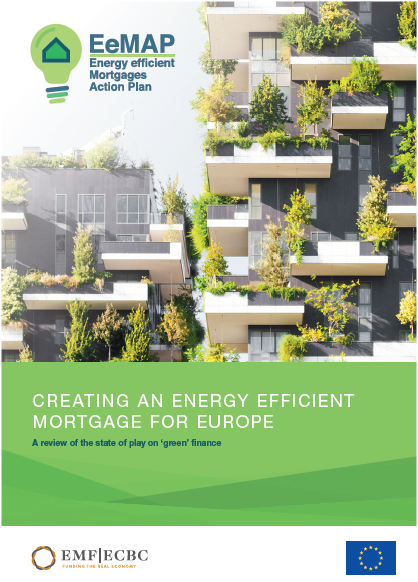 Green Building Councils across Europe launched an ambitious €2.35 million project to support governments in designing and implementing the national renovation strategies. 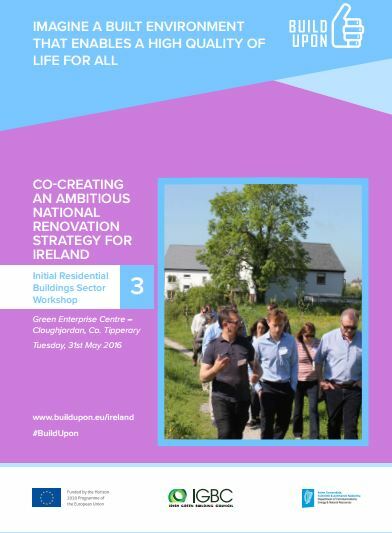 Dominic Miles Shenton of Leeds Metropolitan University presents research on the gap between actual performance of constructed residences and the designed performance. 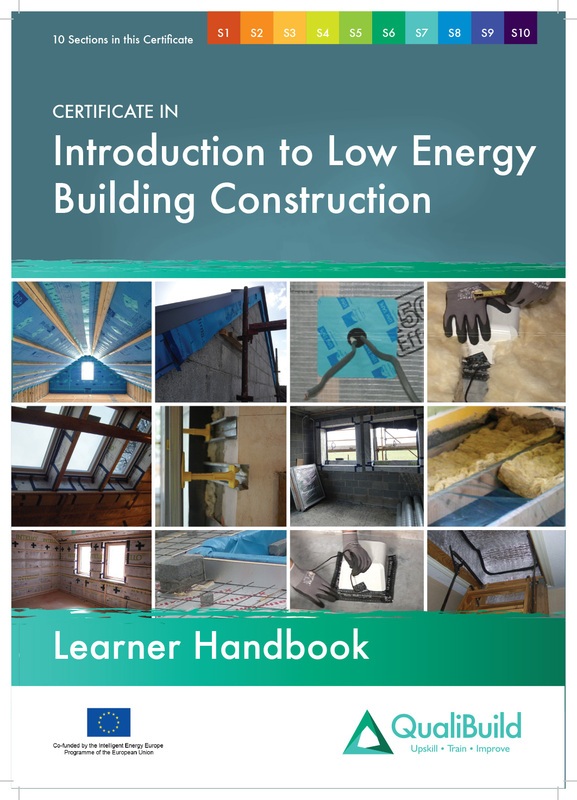 This is based on an extensive study on a completed residential development. 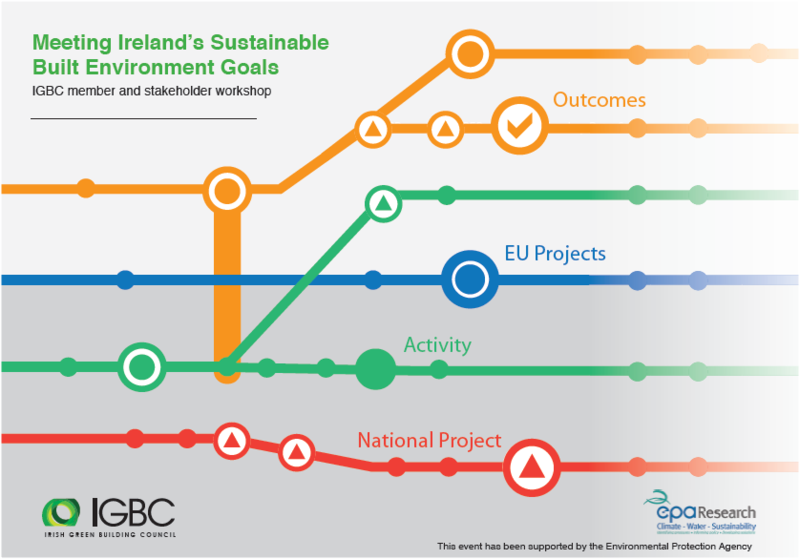 EU framework for Sustainable Assessment conference. 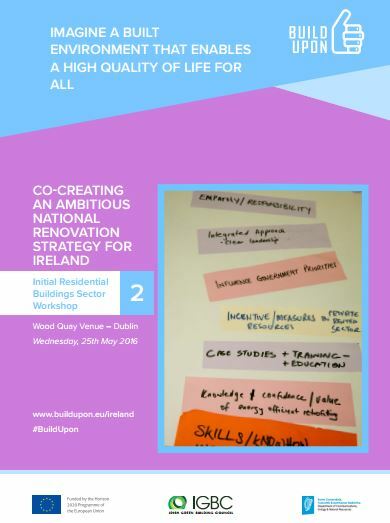 Representatives from DG Enterprise and Industry, European Commission speaking at the conference organised by the European regional network on the development of the Framework for Sustainable Assessment. 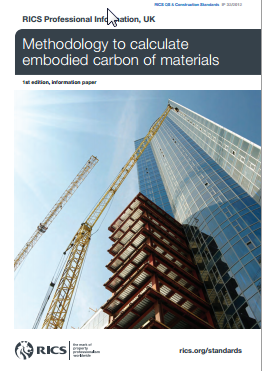 The Inventory of Carbon and Energy (also know as the ICE database) is a free database for building materials which is free to download. 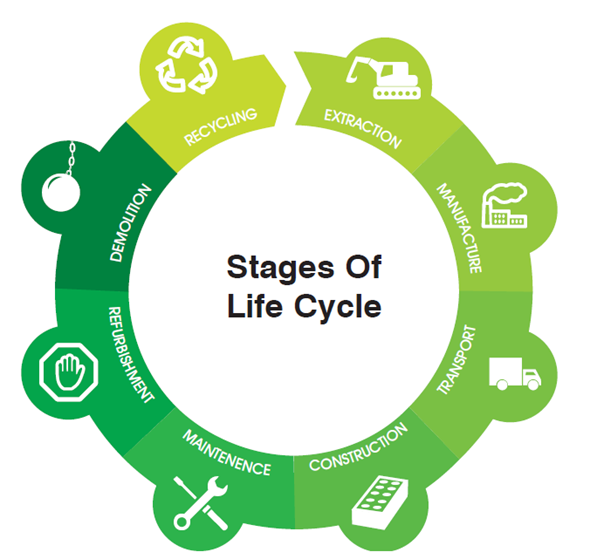 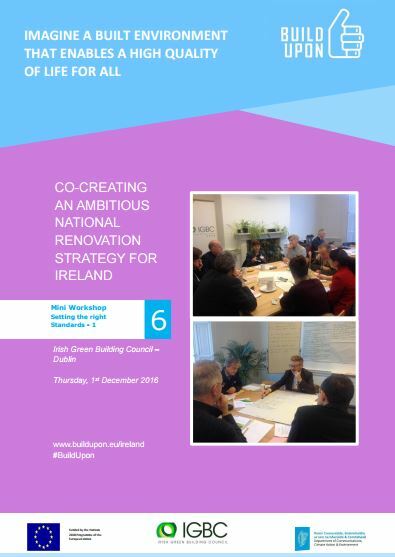 This document sets out the Irish Government’s National renovation strategy as submitted to the European Commission at the end of April 2014. 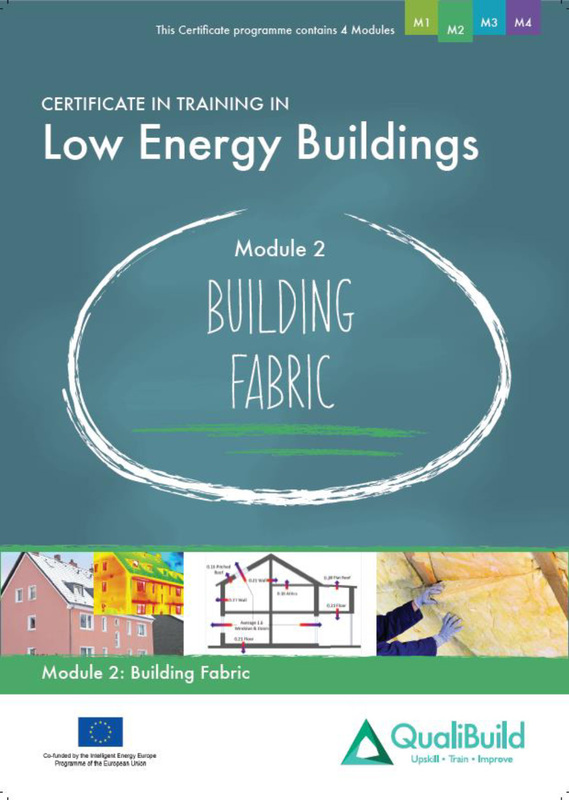 This report from UCL Energy Institute compares the impact of the German KfW program for energy efficency with the UK polices, and discusses the reasons for its success. 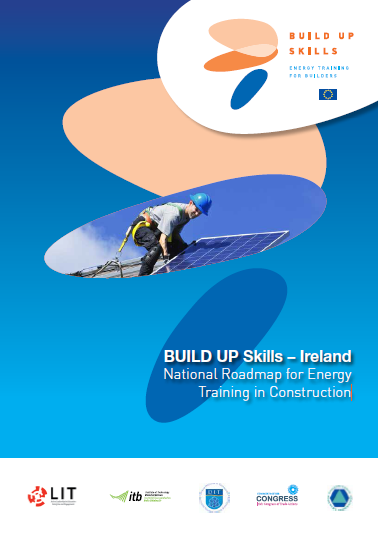 The national qualification roadmap for Ireland sets out the strategy and action plan for improving the knowledge, skills and competences of Irish construction workers. 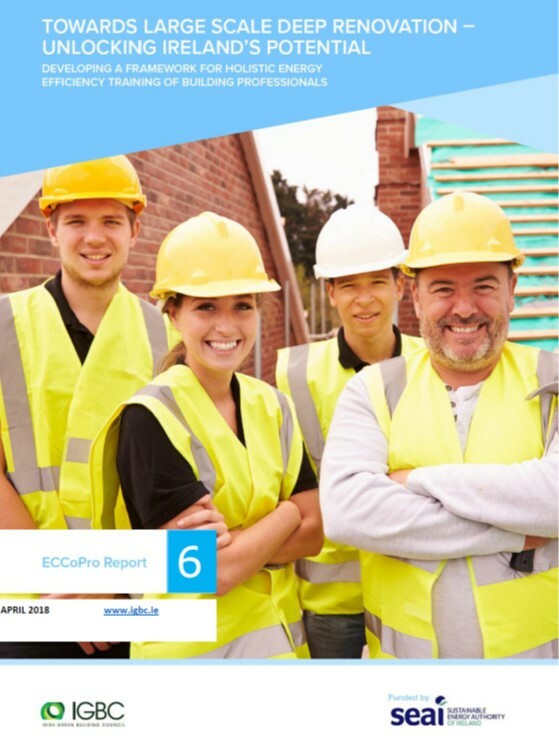 What does Quality construction mean? 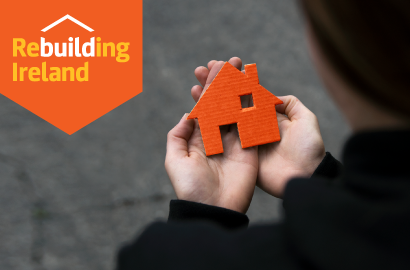 We asked attendees at the Better than Best practice conference to define what quality in building means. 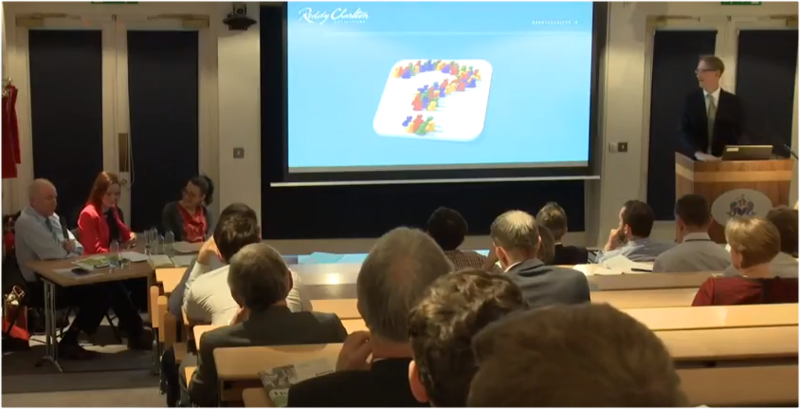 Robert Butler explains at the Better than Best Practice how the CPD will be required under the CIRI registration system. 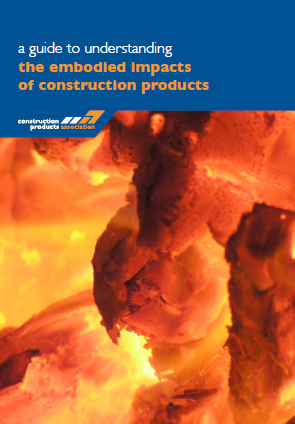 This publication from the Construction Products Association sets out guidance on the embodied impacts of materials. 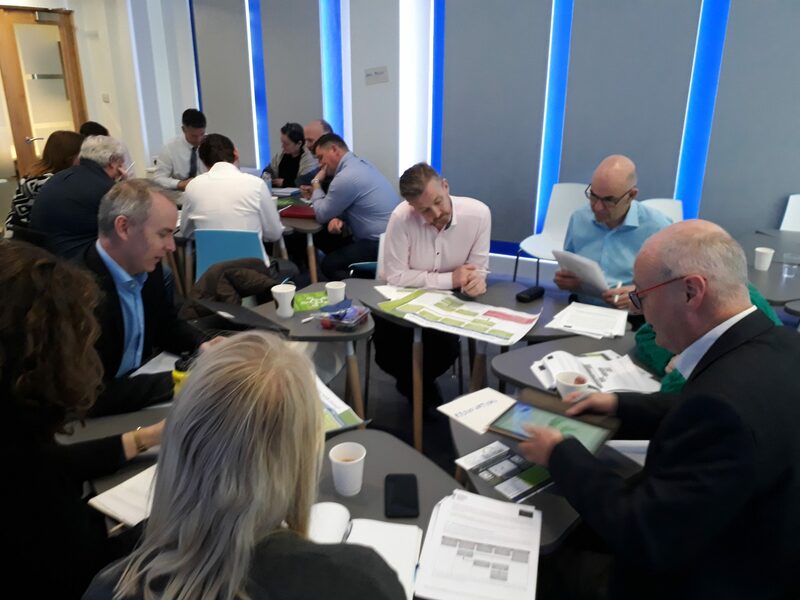 William Purcell of South Dublin County Council building control department discusses the Building Control (Amendment)Regulations from the building control officers point of view at the Better Building Conference. 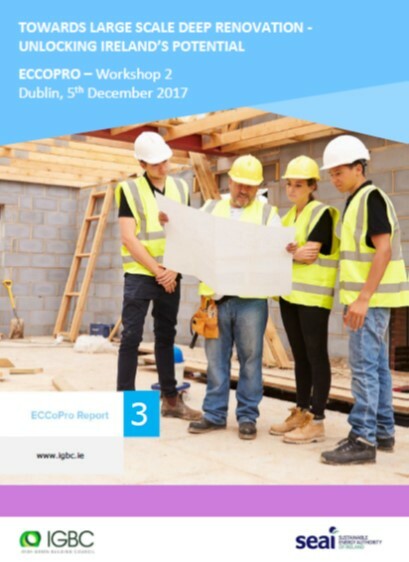 Hubert Fitzpatrick of CIF presents on the Impact of the Building Control Regulation amendment on builders and how the registration process will evolve in relation to overall compliance with the regulations. 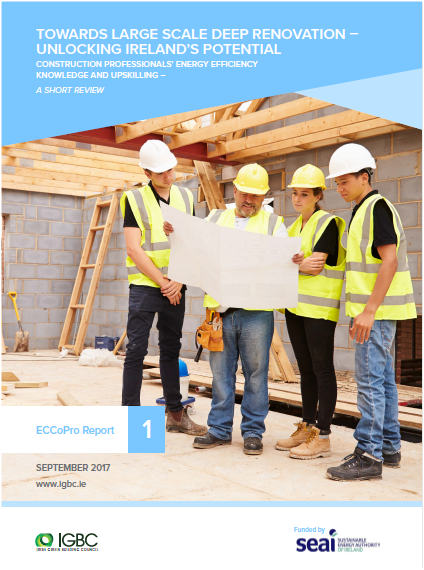 Orla Fitzgerald presents on the Building Control Regulations amendment SI9 and it's implications for architects. 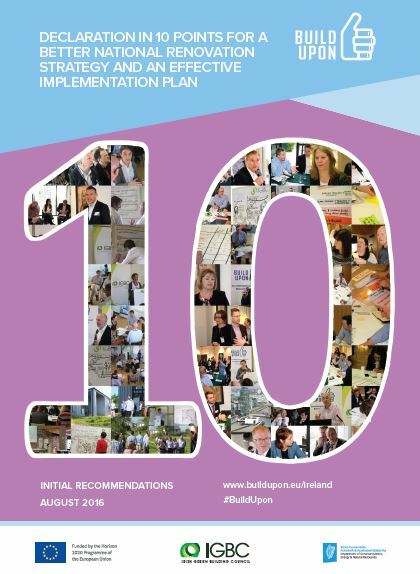 She looks at the areas of: competence, resources, documents and certification. 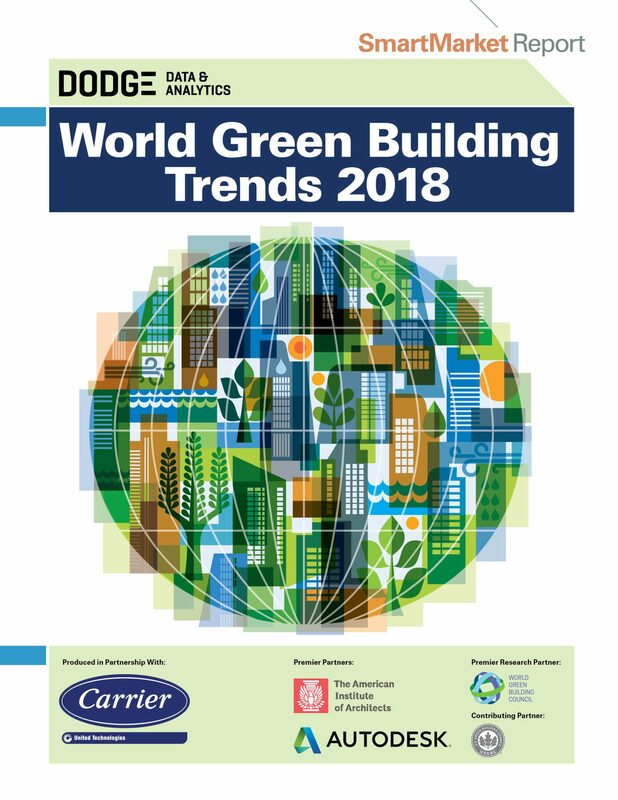 Kevin Hydes former chair of the US green Building Council Integral Group presents on the drivers that are revolutionising the building industry. 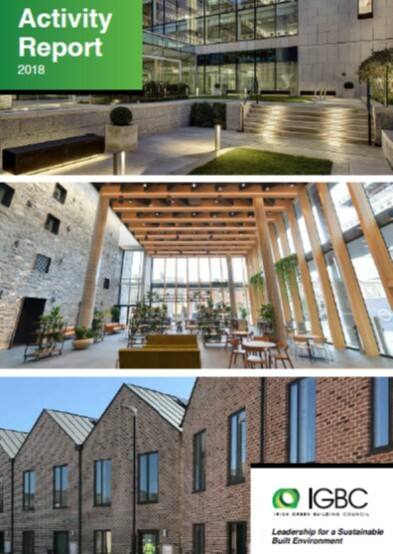 Chris Rogers of Point 32 presents a case study of the Bullitt Centre in Seattle and how it realised The Living Building Challenge, the world's most rigorous construction standard. 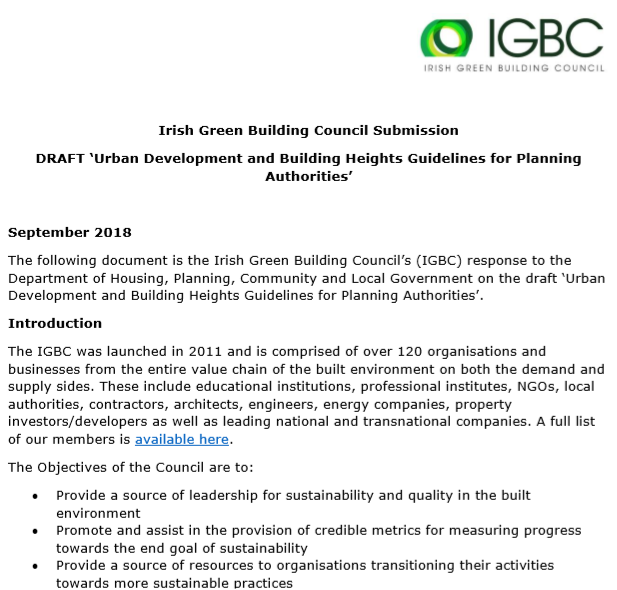 Corrine Block Raguin of Cerway the certification body charged with internationalising the French Green Building system HQE, talks about the HQE residential scheme. 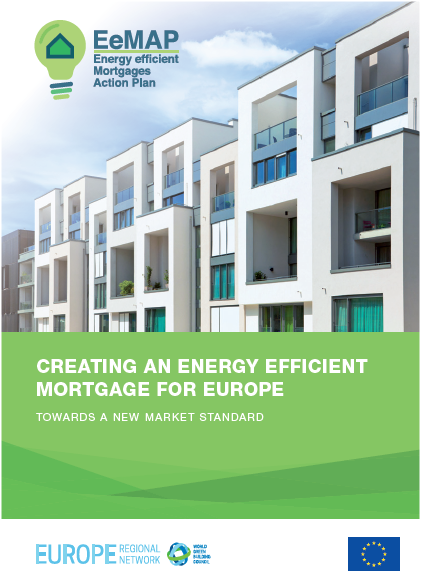 There are over one million homes in France certified using this system. 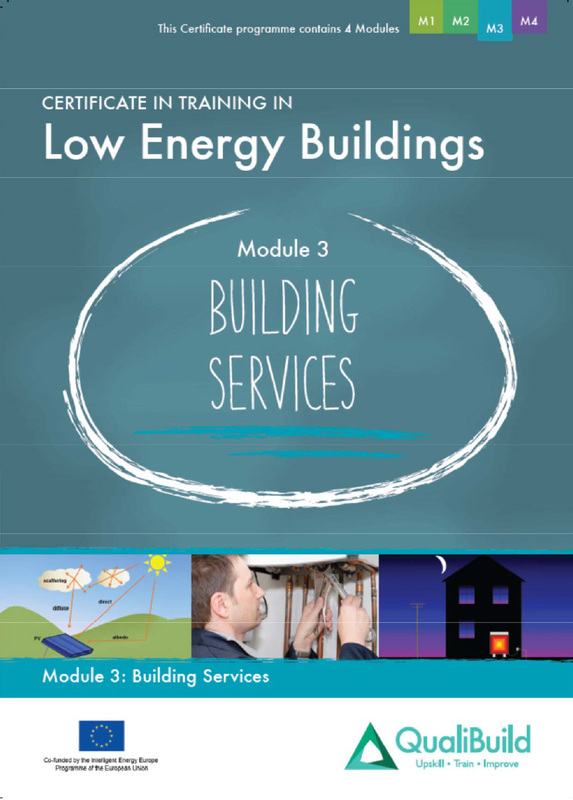 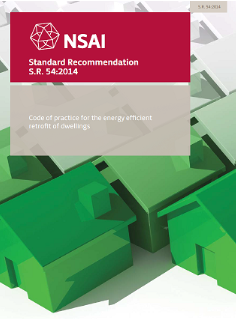 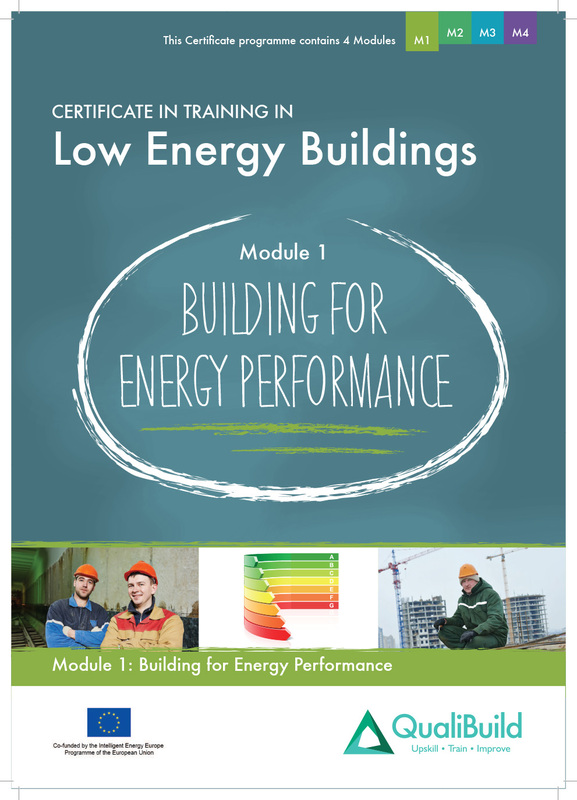 This document sets out the cost optimal calculations for Irish non residential buildings and was submitted by the Irish Government to the EU commission to comply with the Energy Performance of Buildings Directive in April 2013. 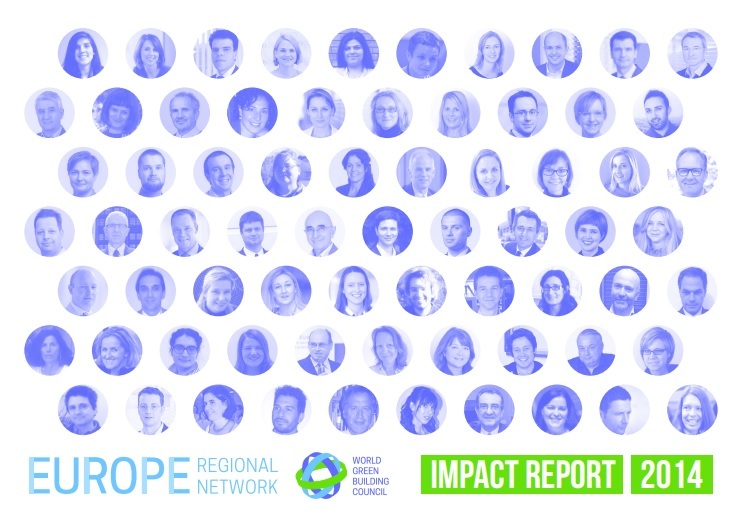 The European regional network made great strides in 2014, read about the growing impact. 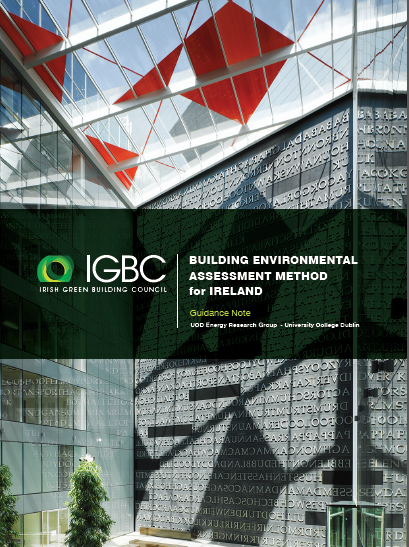 This IGBC Guidance document is based on a workshop comparing the three most common European systems, BREEAM, DGNB, and LEED. 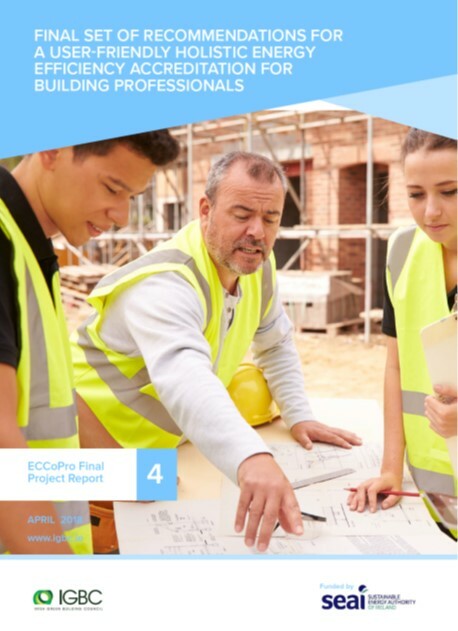 Guidance on the need to future proof construction of commercial buildings to ensure that they meet the requirements of the EU directives on Energy Performance. 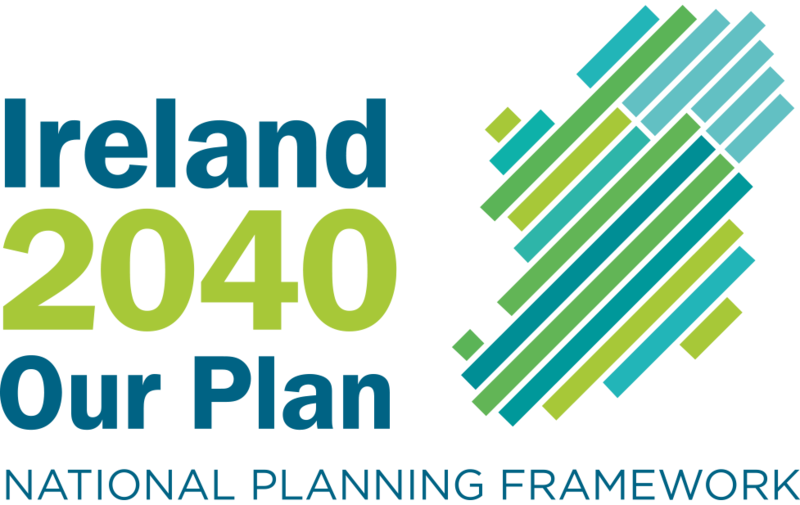 Debate on 2030 targets gets underway, Countdown to establishing first national renovation strategies begins and more. 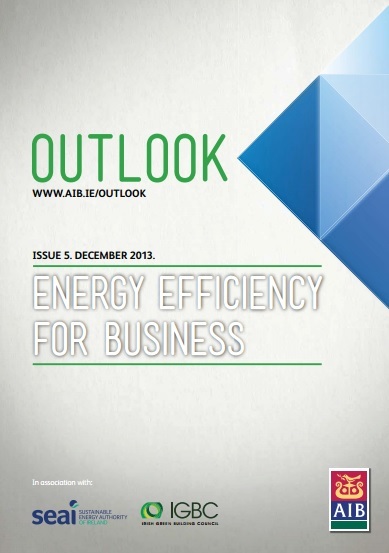 2030 Climate and Energy Framework debate heats up, New EU Public procurement laws to focus on quality and more. 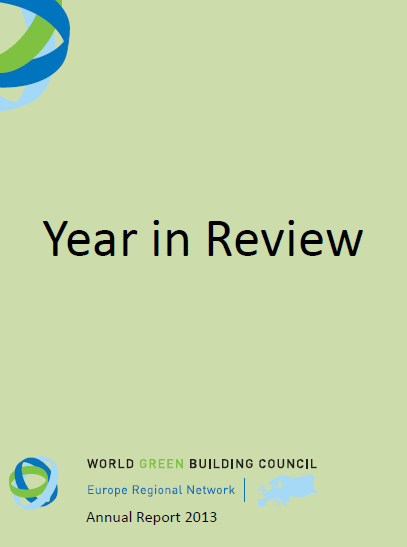 Highlights from the Better Building Conference in 2013. What should an Irish rating system look like? 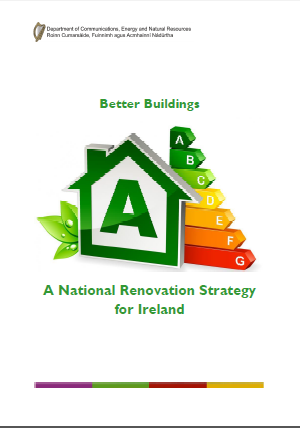 We asked national and international experts at the Better Building conference what an Irish residential rating system should look like? 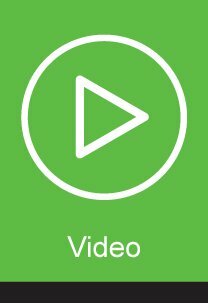 This is what they said. 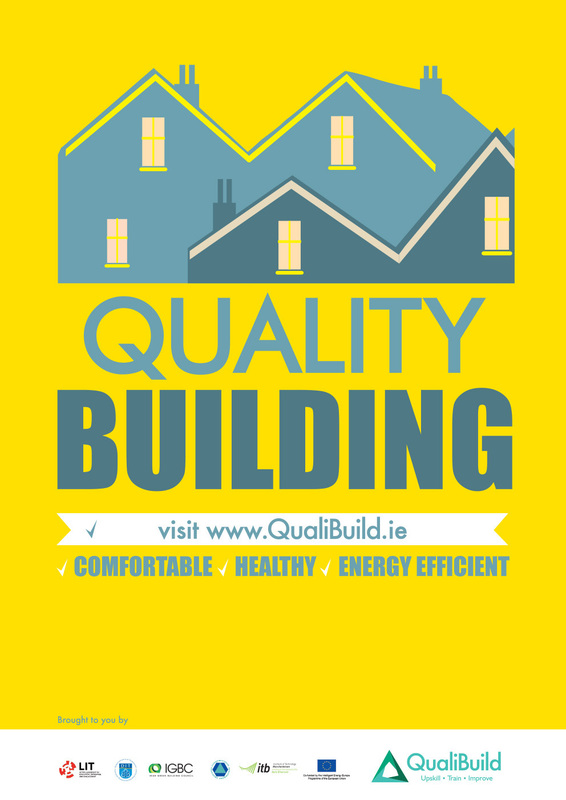 What is quality sustainable building? 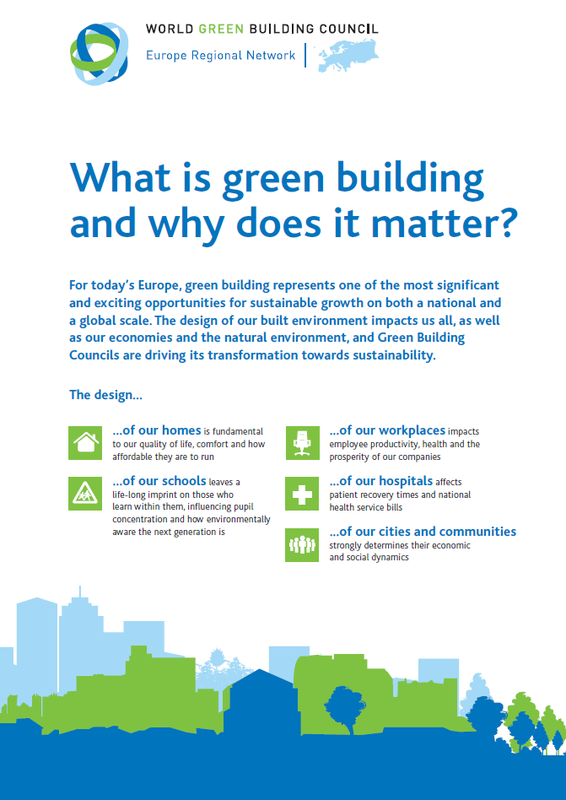 We asked international experts at the 2014 Better Building conference to define quality sustainable building. 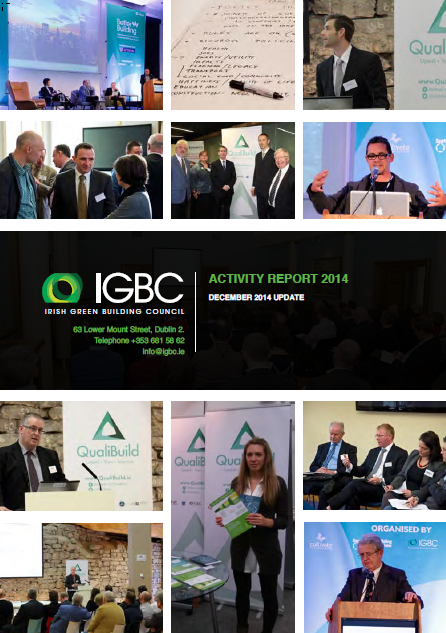 This is a brief overview of the main activities of IGBC in 2014. 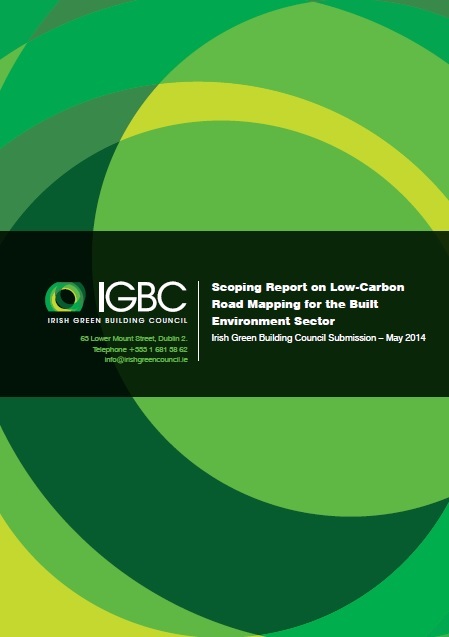 IGBC made a submission on the Government scoping document for the Low Carbon roadmap for the Built Environment. 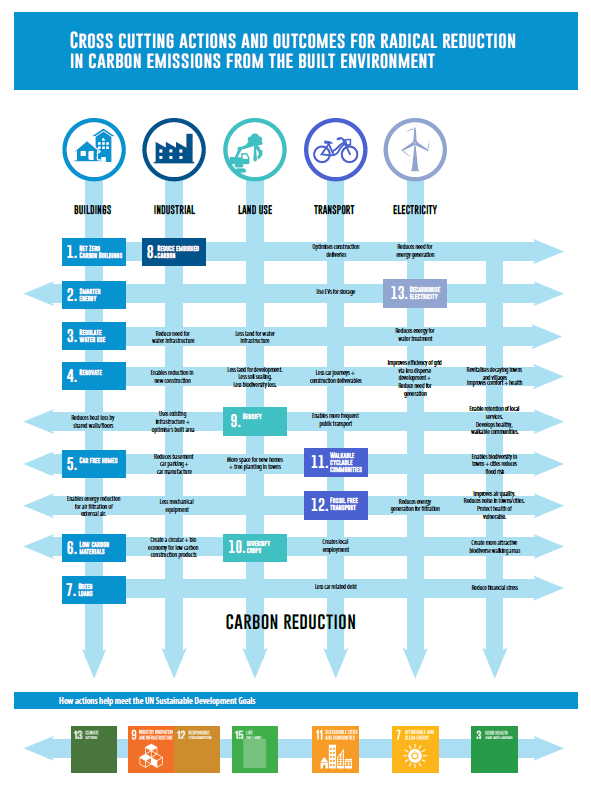 This scoping document is one of four roadmaps been prepared to inform the Climate Change act. 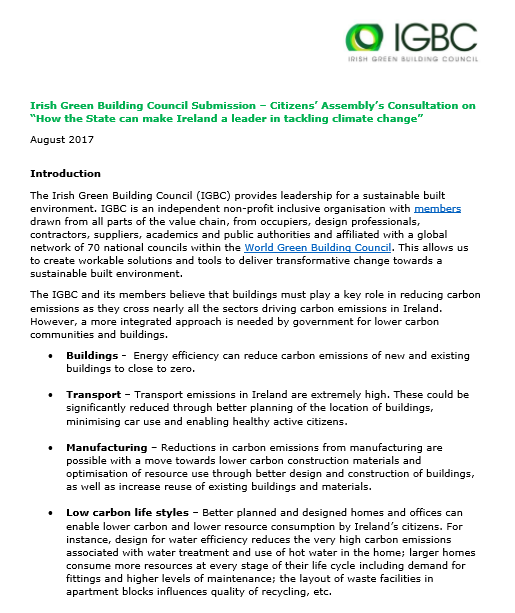 The built environment plays the key role in a more energy efficient Ireland as it affects energy used in buildings, energy used for transport and the efficiency of the grid. 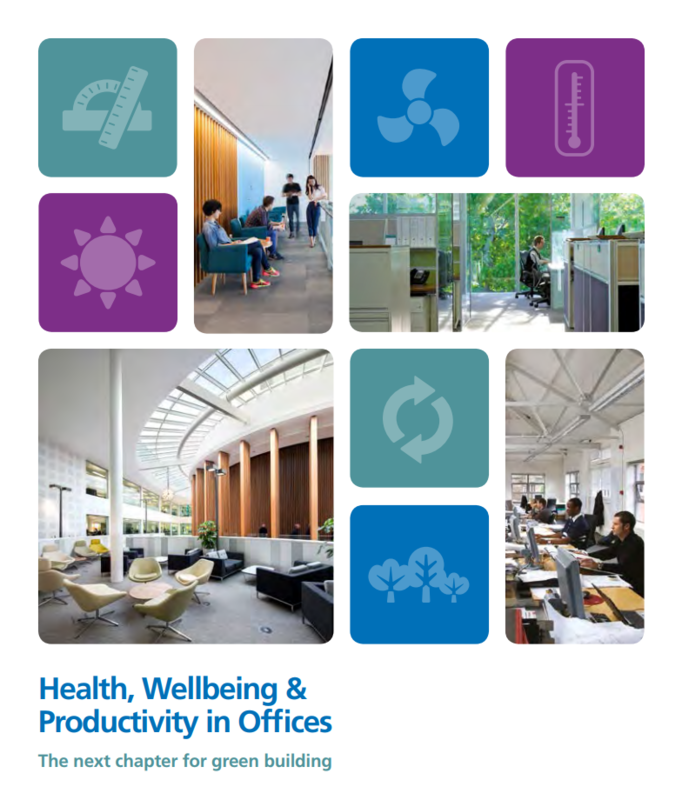 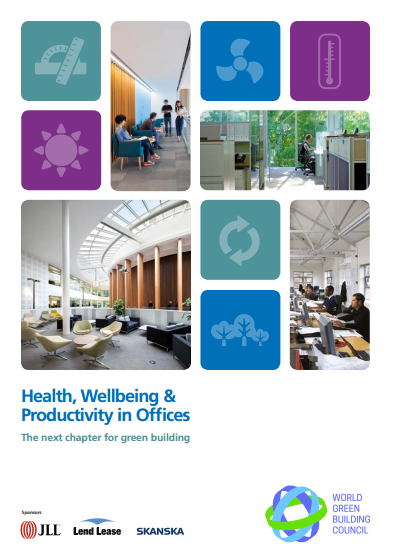 The Next Chapter for Green Building, presents overwhelming evidence that office design significantly impacts the health, wellbeing and productivity of staff. 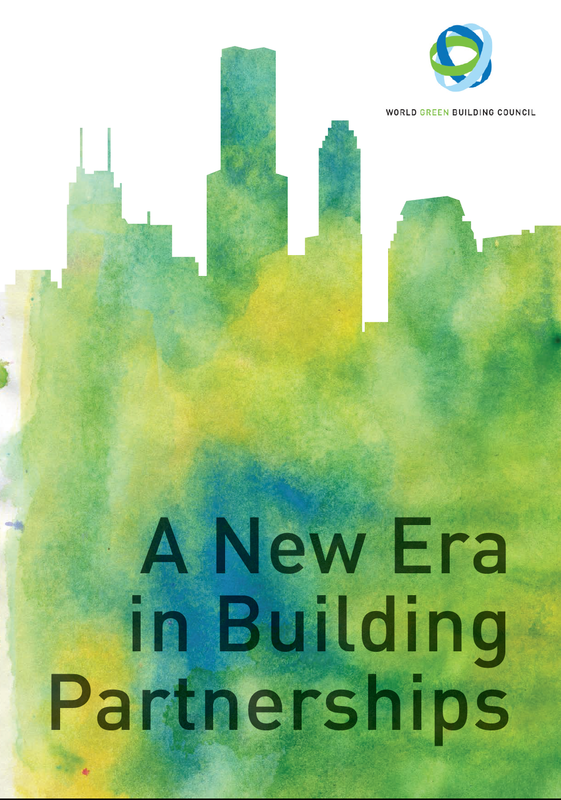 The 3rd Better Building conference took place on 9th April 2014. 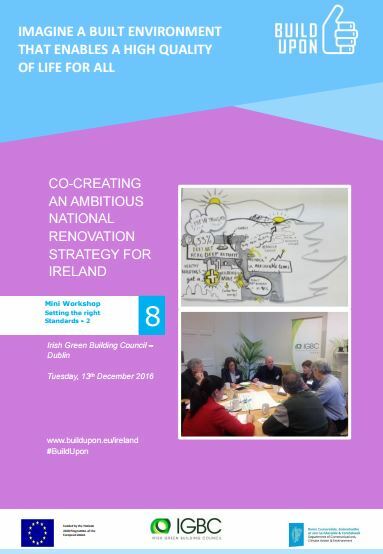 This year Ireland's largest construction and property conference, conference focused on the sustainable retrofit and the move to near zero energy buildings. 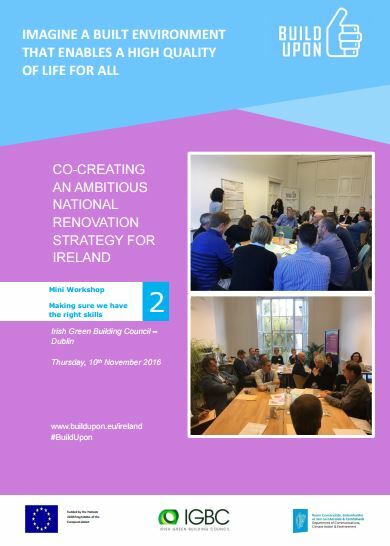 Trine Petrou Mach of Nordic Innovation presents on how collaboration between Government and Industry delivering the green building agenda in Nordic Countries. 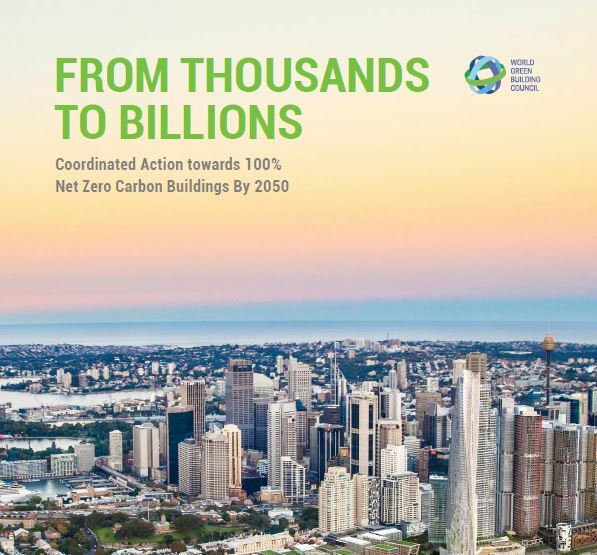 Paul King CEO of the UK Green Building Council sets out how collaborative policy making, between industry and Government helped deliver the deliverables of the Zero Carbon Hub. 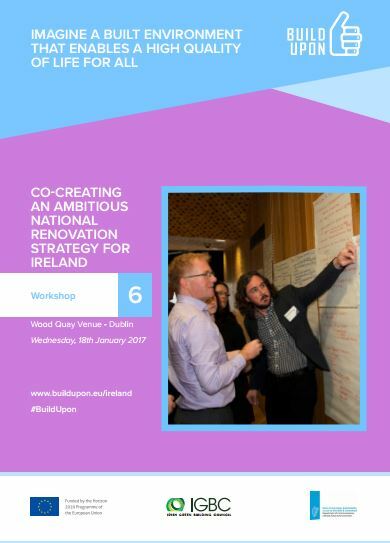 Trine Petrou Mach sets out the Nordic Build concept at the Better Building Conference. 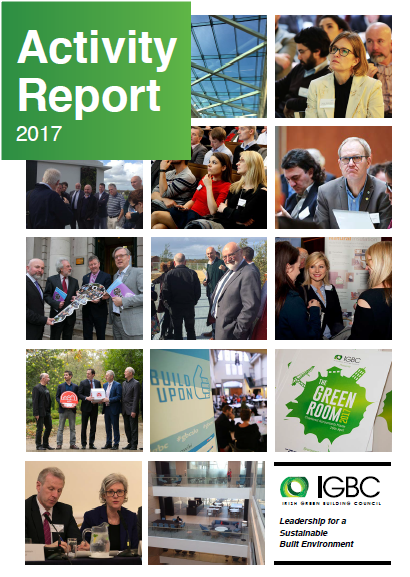 Thomas Mueller President of the Canada Green Building Council sets out the role Canada GBC played in transforming the industry in Canada. 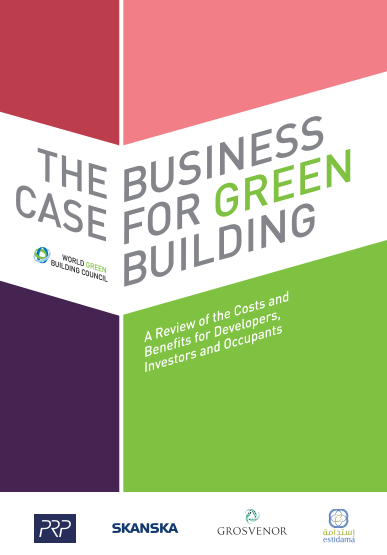 Noel Morrin Vice President Sustainabilty Skanska presents the World Green Building Council's report - The Business Case for Green Building, at the 2013 Better Building Conference. 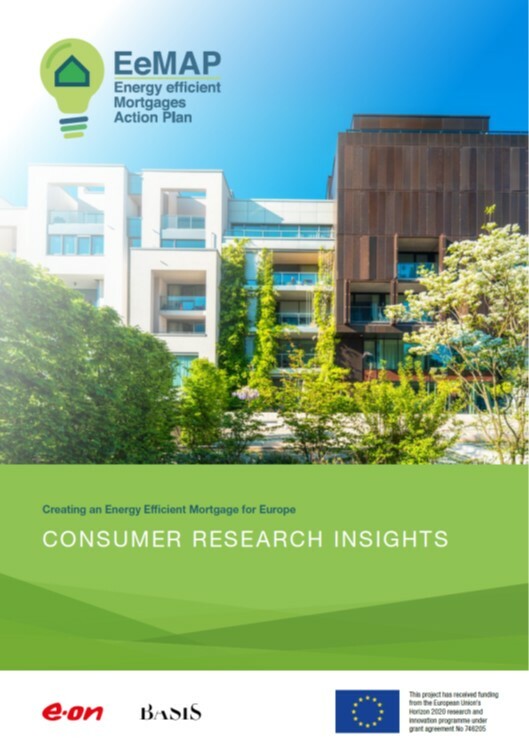 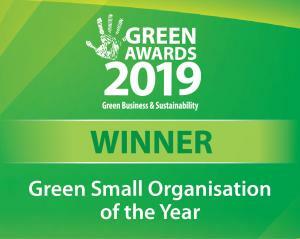 AIB research report conducted among 451 small and medium enterprises (SMEs) in partnership with the Sustainable Energy Authority of Ireland (SEAI) and the Irish Green Building Council, found that achieving energy efficiency is high on the agenda of manufacturers, retailers and other business sectors. 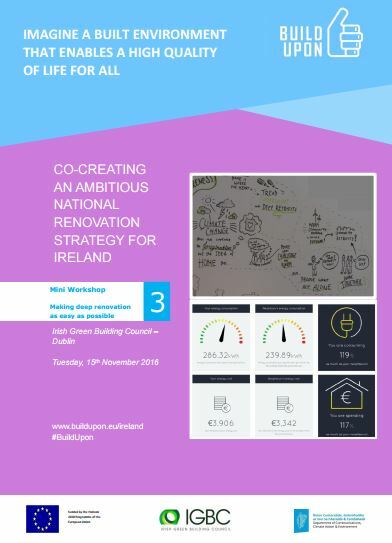 Irish Green Building Council released the outcomes of the workshop that it held in January to help inform the development of Government long term roadmap to reduce energy form the built environment by 80%. 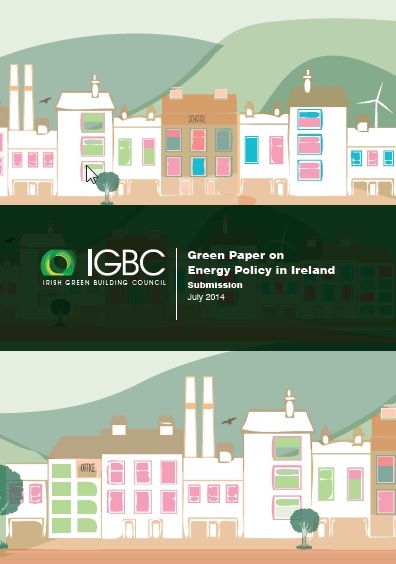 We have submitted our thoughts on the Green paper on Energy In Ireland to Government. 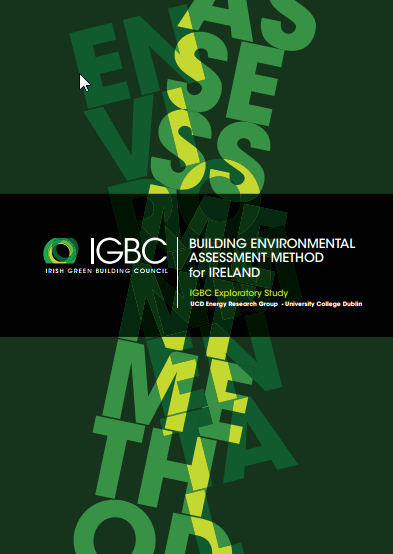 This document was prepared and published in 2012 explored the use of Building Environmental Assessment methods across Europe, with a view to exploring what approach IGBC should take to these tools. 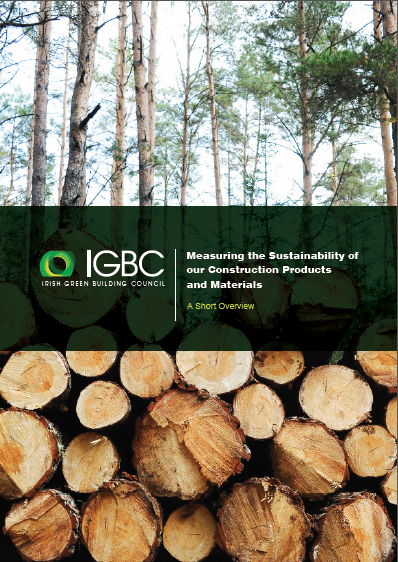 IGBC published this overview of how sustainable construction products are measured across Europe and the future for sustainable products.